Thousands of options exist when it comes to making pasta--everything from butter, parmesan, salt and pepper for a simple meal to all-out béchamel and cream sauces for pure decadence. Add virtually anything to pasta as your tastebuds (or your fridge content) and mood decide. In addition to its versatility, pasta is one of the great comfort foods intended to be shared with others along with stories, conversation, and relaxation. Today is just one of many ways to prepare a meal from spaghetti (or linguini or gemelli or whichever pasta is sitting on your shelf) by combining a few additional ingredients to turn this in to a satisfying dish. 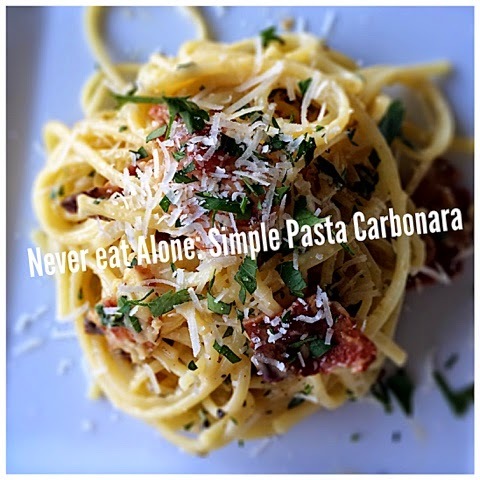 This particular recipe is a simplified version of an Italian classic 'Carbonara' from the GreenPan Cookbook (Free after purchasing my new non-stick pan). Their recipe has less ingredients, less fat and minus the traditional peas and cream. I had pancetta, but use bacon to save money or if you can't find pancetta. Pasta is just one of those staples you need to keep in your pantry, because it might save the day coming home from classes, studying late at night, or if your grocery budget simply hits rock bottom! Get some friends together tonight and wind down with this simple dish. 2. Prep your cheese, garlic and lightly beat the egg yolks. 3. Add half of cheese to beaten eggs and 2 Tbls lukewarm water to create a thick liquid. (If water too hot, eggs will scramble). 4. In a large saucepan, bring your water to a boil with salt, and begin cooking pasta according to package. 5. Sear pancetta and garlic, cool and chop pancetta roughly. (I would just chop prior to searing if I were you to save a step). 6. Return crisp pancetta and 1-2 Tbls olive oil to non-stick skillet over MED-HIGH. 7. When pasta is cooked and ready, remove 1/2 cup pasta water, and drain rest. 8. Add drained pasta to the skillet with 1-2 Tbls butter. Toss with tongs to mix thoroughly. 9. Remove skillet from heat and add the egg mixture quickly to pasta and pancetta. Toss quickly with tongs. If pasta seems sticky, add 1-2 Tbls of pasta water to keep it saucy. 10. Add remaining parmesan and parsley (omit parsley if you do not like flavor). Season with salt and pepper! Make sure your friends arrive on time for dinner!